It gave the Mister an opportunity to play video games and listen to NPR all afternoon without driving me crazy. I was reminded of a post I have long been meaning to write. As I was walking down Manhattan Avenue I noticed an older gentleman taking a photograph of the entrance of 905 Manhattan Avenue: one of the many four story, eight apartment tenement buildings that grace the Garden Spot’s landscape. The object of his interest was not the doorway. His sights were set lower. Much lower. I learned this after striking up a conversation with him; he was interested in iron manufacturing. 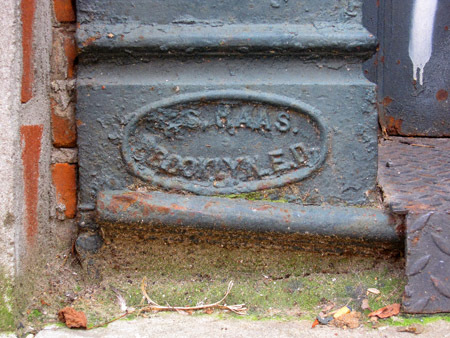 Among the items on his itinerary (to this end he had an annotated map in hand to guide his journey— one has to admire that level of organization) was a manhole cover on Clay Street and a former factory on Monitor Street. 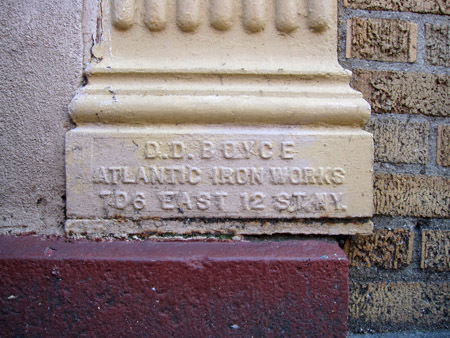 What had attracted this chap’s attention when I encountered him was a cast iron pilaster not unlike these— which can be found on Greenpoint Avenue between Manhattan Avenue and Franklin Street. There are a great number of these to be found in north Brooklyn. What’s more, a fair number of them were manufactured here as well! Take this example at Grand Street. I cannot make out the manufacturer’s name but its place of origin is “Brooklyn E.D.”. In the days before Levitra and Viagra “E.D.” stood for Eastern District— which included what is now Greenpoint, Williamsburg and Bushwick. But let’s head a little closer to home, shall we? Who was “J. Alexander”, you ask? 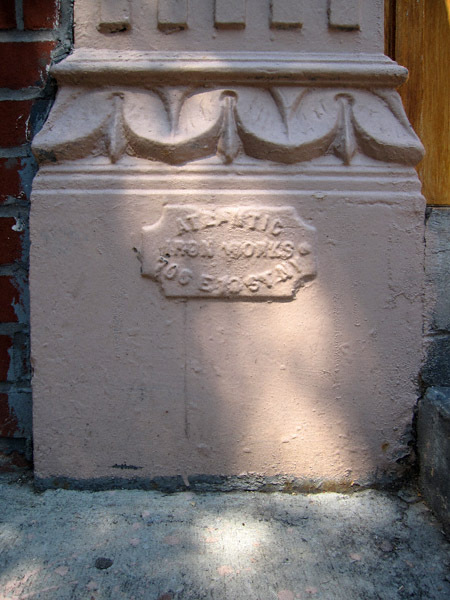 Well, his name was John Alexander and he was the founder of one of the numerous iron foundries in Greenpoint of old. 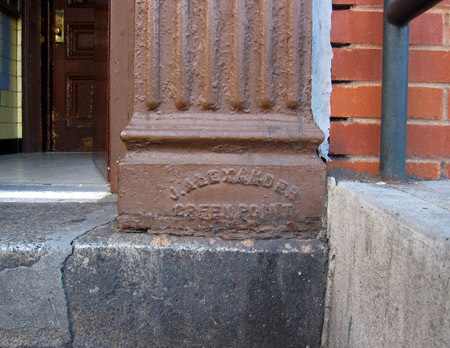 Mr. Alexander’s facility was located on Quay Street between Franklin and Washington Street (now known as West). This is now the site of the MTA’s (delightfully named) Mobile Wash Unit garage. 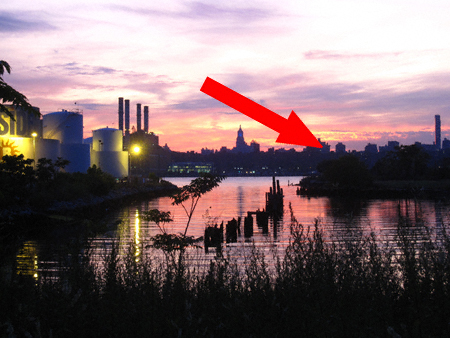 QUICK ASIDE: the next time you walk past Bushwick Inlet, look carefully for the American flag stationed across from the Bayside Tanks. This was where the Monitor was launched. 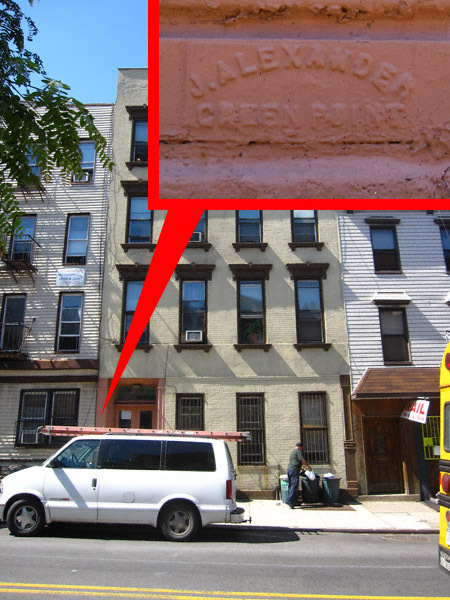 But let’s get back to Mr. Alexander— and the site of one of the Garden Spot’s more colorful land grabs. It’s a classic tale of man versus machine. Or in the case of this article from the April 9, 1878 edition of the Brooklyn Daily Eagle: a man’s fence versus a locomotive. The results are pretty predictable but that doesn’t make this tome any less fun to read. Enjoy! So the next time you walk around the Garden Spot keep in mind that history is all around you. All you need to do is look for it. And sometimes the neatest things can be found not by looking up— but looking down. P.S. 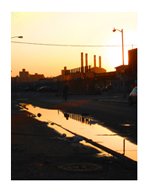 : This post is dedicated to the incredibly cool dude I met on Manhattan Avenue— and his love of the more esoteric points of New York City’s history. *Those of you who are interested in learning more about the Continental Iron Works will be hard pressed to find anything better than this great memoir written by the great grandson of one of the co-founders. Check it out! Feeling a tad euchred myself of late. That’s very cool. My sister is getting her Master’s degree in historic preservation and when she came to visit a couple months ago she was noticing things I’d never noticed before.